Constitution Day is an American federal observance that recognizes the ratification of the United States Constitution and those who have become U.S. citizens. It is observed on September 17, the day the Philadelphia Convention (AKA U.S. 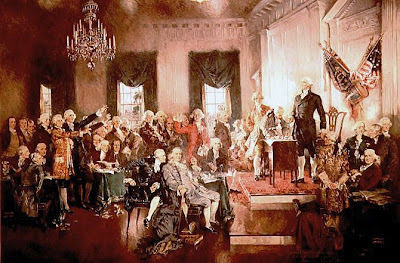 Constitutional Convention) signed the US Constitution in 1787. On September 17, 1787, the delegates to the Constitutional Convention met for the last time to sign the document they had created, it was the second American Revolution. The Convention was formed to revise the "Articles of Confederation." What it did instead was to overthrow the existing United States government and create a system unmatched in its fairness and protection of liberty. The Philadelphia Convention took place from May 25 to September 17, 1787, to address problems in governing the United States of America, which had been operating under the Articles of Confederation following independence from Great Britain. Although the Convention was purportedly intended only to revise the Articles of Confederation, the intention of many of its proponents, chief among them James Madison and Alexander Hamilton, was from the outset to create a new government rather than "fix" the existing one. The delegates elected George Washington to preside over the convention and what was to become the second American Revolution. "There are several parts of this Constitution which I do not at present approve, but I am not sure I shall never approve them. ... I doubt too whether any other Convention we can obtain, may be able to make a better Constitution. ... It therefore astonishes me, Sir, to find this system approaching so near to perfection as it does; and I think it will astonish our enemies..."